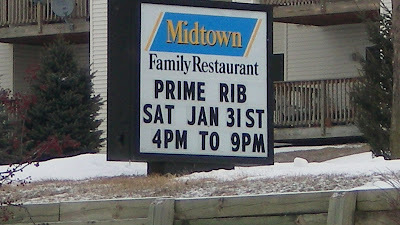 I had heard that this was a low-key family friendly restaurant with a giant tenderloin. Driving here reminded me that time has not been too kind to the East side of Iowa City, its now home to many mobile-home parks and quiet neighborhoods. This restaurant looks so humble from the outside, I doubt many students find their way here. Location: 200 Scott Court on the East side of Iowa City. Directions: Scott Ct. is a cul-de-sac beside Scott Ave on the Eastern Edge of Iowa City. You need to take E Court St to find this place. 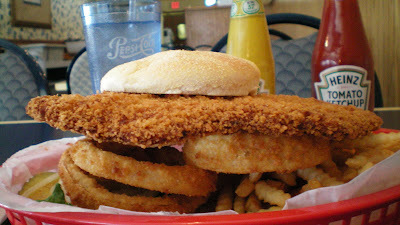 The Tenderloin: This is served in a basked deliberately too small for all the fried food inside The impressive thing here is the width. 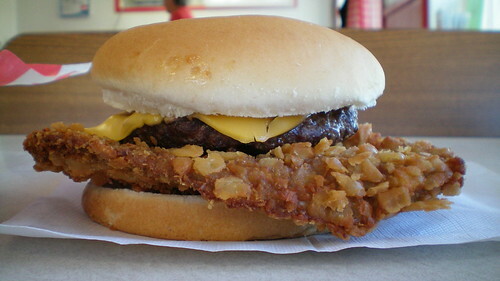 Its tough to get your fingers around this thing and grab the bun underneath. The whole thing was relatively thin, but still soft inside. The breading was crunchy with loads of crumbs spilling out with each bite. Also on the menu: A very typical menu for any place with the word "family" in the name, with some homemade appetizers. Service: Table service which was a bit slow in the lunch hour when I visited. Ambiance: The interior could have been designed by my grandmother. This is the opposite of the hip restaruant/bar places in the pedmall area near campus. The crowd was from more of the older end of the age spectrum. Final Thoughts: Its like this part of town had been forgotten since the gigantic mall was built in Coralville, and the corridor with Cedar Rapids became one of the fastest growing parts of Iowa. Few visitors travel to the east side of Iowa City, but this restaurant is worth it. You are being far too kind to this restaurant. I live one block from the place and I can tell you that upon my few walks up there to eat, it only gets worse. The place is here for one purpose; to satisfy the palette of old midwesterners whose tastebuds never tasted anything different and think it is just fine. It's pretty much fast food in a sit down environment. All frozen, all the time. I just had their tenderloin there two nights ago. I think their food is delicious! (I'm not an old midwesterner with dead taste buds).Whoever anonymous above is must have a grudge against the owners. I've enjoyed this tenderloin and other things on the menu for years. I'm also curious as to why this loin didn't get rated. This is one of Iowa City's best kept secrets. It is old fashioned,somewhat fast foodish, but I think it is one of the best priced little restaurants in town, You get fairly good portions at a fair price. I believe alot of their food is homemade unlike a Perkins or Village Inn. I also like Midtown 2 at the Walmart exit in Iowa City. Very good food, priced right,and they have one of the nicest people working there,Mick............. Just give them a chance. They are homed owned and trying to make a living. 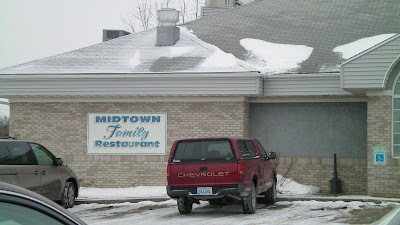 My wierdo in-laws scheduled our rehearsal dinner at the Midtown 2. I think it's tacky and from what I hear they don't serve alcohol. Thumbs down!! That first person who put down this restaurant, is crazy. They have great food, and their tenderloin is to die for. They are always pleasant, and we love going there. As a professional chef who lives and works in the 5th largest metro in the Country I can definitively say this is one of the best tenderloins you will eat. I grew up down the street, and whenever I make it back to Iowa City, I make a point to have lunch here with my Grandparents. 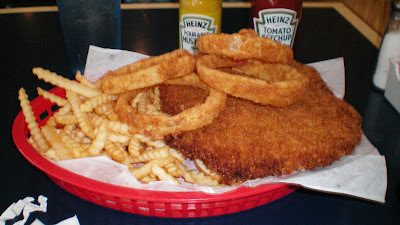 Jumbo Tenderloin never disappoints, the homemade pies are also excellent. The negative posters need to get over themselves. This place is just classic greasy spoon! If you expect to be served Michelin Star food here you are a moron. You are buying a $7 Burger Basket with Fries.